"...I wish to recall the figure of St Francis de Sales, whom the Liturgy commemorates on 24 January. Born in Savoy in 1567, he studied law in Padua and Paris and then, called by the Lord, became a priest. He dedicated himself to preaching and to the spiritual formation of the faithful with great success. He taught that the call to holiness was for everyone and that each one as St Paul says in his comparison of the Church to the body has a place in the Church. St Francis de Sales is the patron Saint of journalists and of the Catholic press." 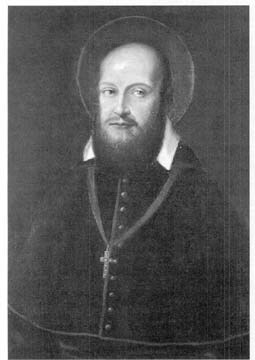 St. Francis de Sales (1567-1622) born in Thorens, Savoy, in France, was Bishop of Geneva; here he fought Calvinism vigorously. With St. Jane de Chantal, he founded the Order of the Visitation. He wrote Introduction to the Devout Life, a classic of spiritual direction. He died in Lyons and was canonized in 1665. In 1877, Pius IX proclaimed him Doctor of the Church. Pius XI declared him patron of journalists and other writers. To me, though I am the very least of all the saints, this grace was given, to preach to the Gentiles the unsearchable riches of Christ, and to make all men see what is the plan of the mystery hidden for ages in God who created all things; that through the church the manifold wisdom of God might now be made known to the principalities and powers in the heavenly places. This was according to the eternal purpose which he has realized in Christ Jesus our Lord, in whom we have boldness and confidence of access through our faith in Him. As the Father has loved Me, so have I loved You; abide in My love. If you keep My commandments, you will abide in My love, just as I have kept My Father's commandments and abide in His love. These things I have spoken to you, that My joy may be in you, and that your joy may be full. "This is My commandment, that you love one another as I have loved you. Greater love has no man than this, that a man lay down his life for his friends. You are My friends if you do what I command you. No longer do I call you servants, for the servant does not know what his master is doing; but I have called you friends, for all that I have heard from my Father I have made known to you. You did not choose Me, but I chose you and appointed you that you should go and bear fruit and that your fruit should abide; so that whatever you ask the Father in My name, He may give it to you. This I command you, to love one another. Our catechesis today deals with Saint Francis de Sales, an outstanding Bishop and master of the spiritual life in the period following the Council of Trent. After a powerful experience of God’s liberating love in his youth, Saint Francis became a priest and then Bishop of Geneva, at that time a stronghold of Calvinism. His fine education, his personal gifts of charity, serenity and openness to dialogue, together with his brilliance as a spiritual guide, made Francis a leading figure of his age. His spiritual writings include the celebrated Introduction to the Devout Life, which insists that all Christians are called to perfection in their proper state of life, foreshadowing the insistence of the Second Vatican Council on the universal call to holiness. His Treatise on the Love of God develops this teaching, stressing that we find ourselves and our true freedom in the love of God. The Christian humanism of Saint Francis de Sales has lost none of its relevance today. May this great Saint and Doctor of the Church guide us in the pursuit of holiness and help us to find our fulfilment in the joy and freedom born of the love of God.